Thu, Oct 18, 2018, 11:49 pm SL Time, ColomboPage News Desk, Sri Lanka. Oct 18, Colombo: Sri Lanka will not allow any sudden hike in domestic LPG gas prices right away, even if the global crude rates continue to rise, Minister of Industry and Commerce Rishad Bathiudeen said. Speaking to the representatives of Sri Lanka's largest LPG importer, cylinder distributor and supplier Litro Gas Lanka (LGL) Thursday (18), the Minister said the government's priority is to safeguard the consumers and hence the industry's support to the government and people is very important right now. The Litro representatives were making a strong call on Minister Bathiudeen and Consumer Affairs Authority (CAA) to upwardly revise the 'transport cost component' within the LPG pricing formula already agreed by with the CAA. Litro representatives said that the diesel costs have continuously escalated since 2007 making their LPG transport costs also to escalate eroding their margins. The costs have come to a level where they cannot profitably operate anymore and industry is facing an imminent shutdown if it continues in this way, they pointed out. The representatives then handed over their proposal to hike LPG rates to Minister Bathiudeen calling to increase the 'transport cost component' which is a component of CAA agreed composite LPG gas price formula. CAA officials reiterated that Sri Lankan domestic LPG prices in the market are now determined by a pricing formula agreed between the two LPG players (LGL and Laugfs) and the CAA, and sudden ad-hoc changes are adverse to the consumers and households that are heavily dependent on the cylinders. "We commend you, the LPG gas suppliers for your continued service to our consumers. There have been changes in global market LPG rates as well as local transport costs due to international crude oil price hikes," said Minister Bathiudeen. He added that the crude price hike is hurting the economy in many ways and LPG industry is no different. At present global crude oil prices are at a four year high and the consumers are facing the impact directly. "Very recently in CAA's September 27 determination, we already allowed District-to-District LPG prices with adjustments for transport, which is the pricing framework now in effect. Revising this already revised LPG market prices again at this moment is very damaging to our consumers. Always our priority is to safeguard them. Your support to the government as the largest LPG player, by not raising market prices at this moment therefore is very important. I shall still forward your proposals to Head of the Cost of Living Committee Minister Malik Samarawickrema as well as to the Finance Ministry immediately and await for their inputs." 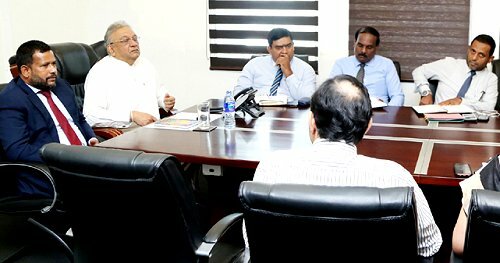 Litro representatives agreeing with Minister Bathiudeen's assessment that any sudden LPG price revisions are harmful to Lankan consumer pledged to assist the government's effort to safeguard consumers while requesting to consider their proposals as well. During today's meeting, Minister Bathiudeen also instructed CAA officials to evaluate Litro proposals and report back to him. Earlier, on 27 September 2018, CAA issued a District-to-District determination on Maximum Retail Prices for LPG cylinders, which is now in effect island-wide. According to the revision, for Colombo District, a 12.5 Kg cylinder at Rs 1733, 2.3kg cylinder at Rs 319, and 5 Kg cylinder at Rs 693. For other Districts, CAA even allowed sellers to add a fixed transport cost, which is not applicable to Colombo District. CAA can raid any seller who violates these LPG MRPs. According to Section 60 of CAA Act No 9 of 2009, conviction results in fines and even imprisonment. Section 60 -Sub section 4 (i.e S 60.4) defines the penalties. S.60.4 (a) pertains to individuals, slaps Rs 5000-50000 fine and/or up to one year's imprisonment for first time offenders and for subsequent violations, Rs 10000 to 100,000 fine and/or up to two years' imprisonment. S60.4 (b) pertains to violations by corporations, slaps Rs 50000-Rs one million fine for first timers and for subsequent violators, Rs 100000 to Rs two million fine. Minister Bathiudeen was joined by his officials from the CAA, Secretary to Ministry of Industry and Commerce KDN Ranjith Ashoka, and Minister of Public Enterprise & Kandy City Development Lakshman Kiriella.